Don't get me wrong... I'm pretty sure that my dogs would happily accept any gifts that might end up under the tree. They're cool like that. Most gracious gift recipients I know. However, sometimes I look at them and have to wonder if they even know it's Christmastime at all. They get presents all year long, after all. So, with that in mind, I decided to channel my puppy love another way this year. 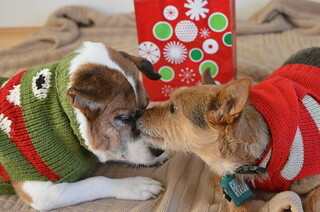 I'm giving the gift of love to some senior dogs in need. Specifically, I'm donating to Frankie's Fund. Muse of my friend Edie, Frankie was an amazing senior dog who inspired many through his blogging adventures. On her blog, Will My Dog Hate Me, Edie chronicled her life with Frankie, provided tips on caring for a senior dog. She shared her struggles and her joys. Recently, she told us about Operation Spoil Frankie as she prepared to let him go. Sadly, Edie recently said goodbye to her beloved pal. In his memory, she has started Frankie's Fund. Donations to Frankie's Fund will be used to help The Grey Muzzle Organization provide hospice care to senior dogs in need. Edie is hoping to raise $5,000 by Christmas - I can't think of a more wonderful way to honor the senior dogs in my life than by giving the gift of love to some homeless senior dogs who haven't been so lucky. If you'd like to help senior dogs this holiday season and are interested in donating to Frankie's Fund, click here or here to find out more. A.J. is the blogger behind I Still Want More Puppies. She's on the leash of Bella, a twelve-year-old Beagle/Jack Russell mix. She blogs about pop culture, pup culture, and anything else that strikes her fancy. On her blog, you can find humor with a dose of heart, and you'll quickly discover that she never met a pun she didn't like. All dogs are puppies to her, and she thinks senior puppies are the sweetest of all.